The dog days of summer are nearly upon us. To celebrate, Australian brewery Little Creatures is releasing its Dog Days Summer Beer – in a can. It’ll be the first time that the Lion Nathan-owned craft brewery has released its beer in cans since the company was first established in Fremantle, Western Australia, in the year 2000. That’s, like, practically 100 in dog years. According to the brewery’s promotional material, cans are more portable and convenient than glass bottles, they keep beer fresher, and they’re recyclable. They’ll get no arguments from us on any of these points, but what about the beer inside? 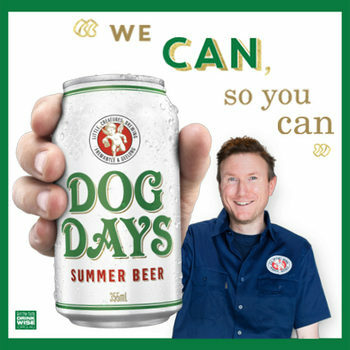 It’ll be the second time that Little Creatures has released Dog Days Summer Beer, following its debut in October last year. The beer is a golden summer ale – 4.4% ABV and 30 IBUs – that currently has a decent overall score of 65 out of 100 on popular beer ranking site RateBeer. Dog Days Summer Beer will be available to order in Australia from today (3 October 2016).